Before starting to build the first iteration of the baseboard I realised that I would be looking at a need for something a bit more sophisticated than the very basic controller that comes with a ‘complete out of the box’ train set. I had already decided that I was going to need four blocks of track so as to allow some degree of interest in the operational side of the layout. It would also be nice to be able to see more than a single train on the move at any time. So, I now knew that I needed four blocks (or areas) within the layout and the option to run more than a single train. A little thought let me see that, if the operation of the system was to be more than basic, two trains was all that could reasonably and safely be handled by one person. So, there it was… I needed a controller with the facility to simulate the control cabs of two locomotives (forward/stop/reverse and throttle) and with the ability to switch and share the control between the four blocks. I was also going to need the ability to isolate various parts of the track from time to time (to allow for standing and parked loco’s) but that was a different and simple exercise and was left for later. First Decision! DC or DCC??? My various readings, paper and web based, had made it clear to me that I would also need various sources of voltage at a variety of levels for my layout, particularly at the early, experimental and design stages. To begin with, this was achieved using bits and pieces of assorted circuit board and battery clips. That gets ‘old’ pretty quickly after a couple of exposed bits suffer from short circuits. It was time to formalise the ancillary power situation! A four channel unit would do the job. 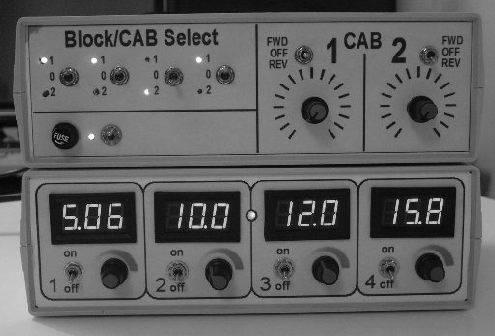 Four channels, independent control, built in voltage indicators - oh yeah! Just before scrapping the original baseboard I had started to build a points control box, which would also contain the area isolator switches. That unit is on hold for now as it will very likely need to be re-designed to allow for changes when the replacement layout design is finalised. The same applies to the indicator/mimic board. All I can say for now is that the unit will be in the same basic format as the units pictured above. A detail page will be added once work is completed on these units.